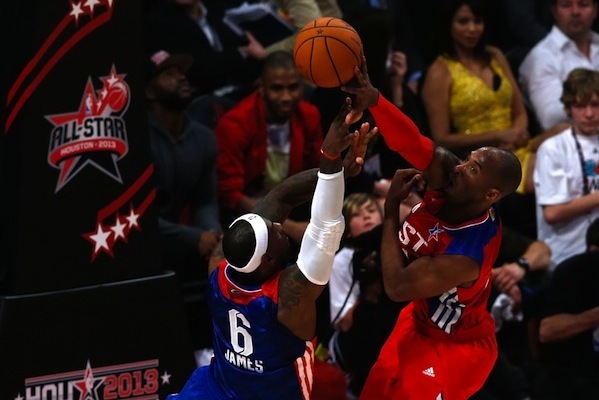 Terrence Ross channels Vince Carter, Chris Paul leads the West, and Kobe Bryant took it to LeBron James as things got testy in the most recent NBA All-Star Weekend, which was held in the heart of Texas – Houston – these past several days. 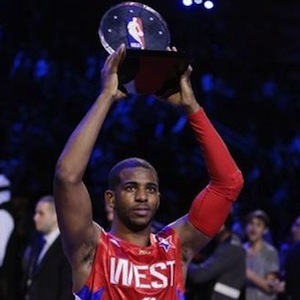 Chris Paul wins his first All-Star Game MVP award. A thing of beauty by Kobe. In the 1990s, Tim Hardaway was the King of the Crossover. Allen Iverson dethroned him in the early 2000s. After watching this over and over, however, it might be safe to say the crossover crown can finally be given to someone else. Sorry it had to be your ankles that got twisted, Brandon Knight. I think Ross’s between-the-legs-over-the-ball-boy jam was sick, but there’s nothing like a throwdown throwback to one of the greatest dunkers of all time. It also helped that the Toronto Raptors jersey Ross wore was the most stylish one the franchise ever sported. So this track star can dunk the basketball! Wow! I mean, he’s the fastest guy in the world, and he can climb the air stairs and stuff it! Of course, the only problem is he doesn’t know how to count his steps. Chris Paul welcomed Joakim Noah to the All-Star Game by hitting a late trey in his face. And then Noah slams his elbow into Paul’s face. And then the West win anyway and Paul runs away with the first individual award of his NBA career, since his ROY. Clearly, still the best PG on the planet. Clearly. I blame Michael Jordan for this one. Actually I thank him. Somewhere out there, his Airness is probably smiling, thinking how, after all these years, he still has the power to influence an actual NBA game. And he didn’t even really lift a finger. All he did was stoke the rivalry between LBJ and KB24 by stating a mathematical no-brainer – 5 is greater than 1. Of course the GOAT knew LeBron didn’t have enough self-control to simply take things in stride. Of course LeBron just had to “defend” himself (giving us a good example of a faulty analogy in the process). Of course Kobe just had to show him up. Not once, but twice. Really with the LeBron hate again... LeBron actually gave a good argument because benchwarmers can win rings. Might also be worth noting that of 19 meetings against Kobe, LeBron has won 13 of them. He is averaging more points, assists, rebounds, steals and blocks than Kobe in those 19 games. Numbers don't lie. I need to find a different blog to read. Anonymous: Conflicting POVs are welcome and encouraged :) I'm sure my fellow Hoop Nut, Rolly, will balance the unabashed hate with more Heat-appreciative insights soon enough. And, no, that benchwarmer argument is really a faulty analogy. There's no way around it. Still, that, along Kobe's two blocks, won't diminish the great season LeBron has been having. I would actually surrender to the argument that MJ's 6 Finals MVPs and Kobe's 2 looks a lot better than LeBron's 1. All good though. I was actually surprised to see Miami atop your power rankings. I will still be an avid reader (outside LeBron articles haha!) hoping for more Gilas content soon!